Hi I am about to get the stock radiator rebuilt. I was wondering if anyone has a picture or drawing of the inside of the tank where the coolant enters and exits the rad. I want to show the Rad shop how the internal baffle is supposed to look like. I hope this makes sense. Just tell them it is meant to be a double-pass style. 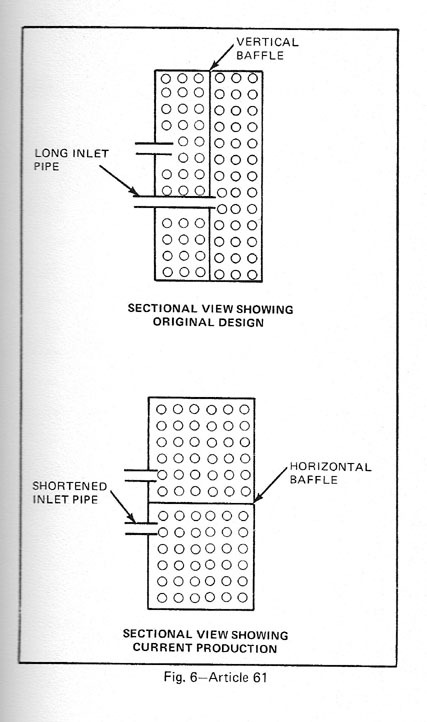 The inlet tank should be divided in to two sections - horizontal baffle. Thus water enters at the inlet and is forced through only 50% of the tubes to the other tank, where the flow is sent through the other 50% of the tubes, to the outlet. Here you go, from the Technical Service Bulletin. 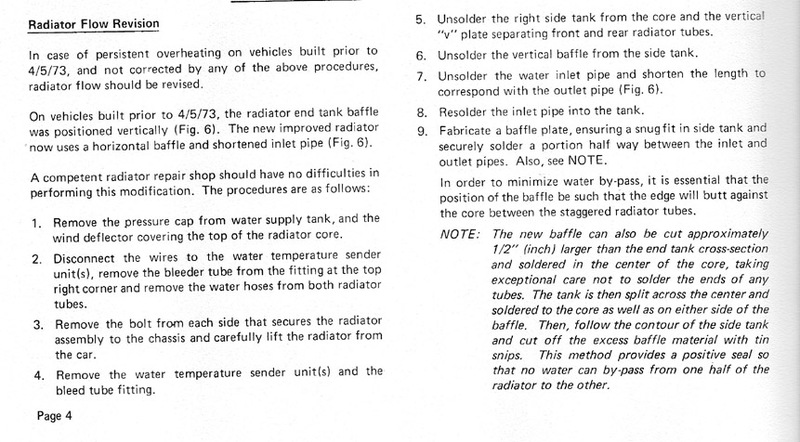 Quite a few copper rad-rebuilders delete the horizontal baffle entirely and solder TWO separate tanks on the core. This absolutely eliminates any leakage past the baffle, as happens in the corrected stock setup. If you do this, also have them extend the inlet-outlet hose spigots by 1-1/2" out, so if you (or another owner) eventually upgrades to shrouded sucker-fans, the stock rad hoses will clear the fans & shroud mounted on the back side without having to cut the spigots and splice more hoses.